Queering Femininity focuses on femininity as a style of gender presentation and asks how (and whether) it can be refigured as a creative and queer style of the body. 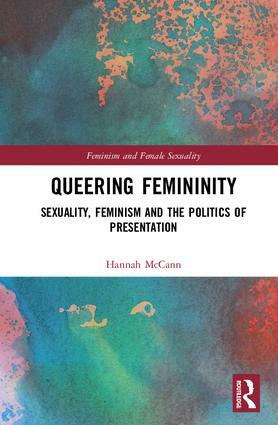 Drawing on a range of feminist texts and interviews with self-identifying queer femmes from the LGBTQ community, Hannah McCann argues that the tendency to evaluate femininity as only either oppressive or empowering limits our understanding of its possibilities. She considers the dynamic aspects of feminine embodiment that cannot simply be understood in terms of gender normativity and negotiates a path between understanding both the attachments people hold to particular gender identities and styles, and recognising the punitive realities of dominant gender norms and expectations. Topics covered range from second wave feminist critiques of beauty culture, to the importance of hair in queer femme presentation. Hannah McCann is a lecturer in gender studies at the University of Melbourne. Her research explores questions of gender presentation, sexuality, identity, beauty, and aesthetic labour. She has published in journals such asAustralian Humanities Review, Australian Feminist Studies, and Women’s Studies Quarterly, and writes on topics including the history of feminism, postfeminism, affect theory, and queer femininity.